Aegeri is a fantastic sailboat of 14.5 meters of length, with capacity for 11 people and equipped with all the extras. Its crew consists of a captain and a sailor, with many years of experience and knowledgeable experts in the area. 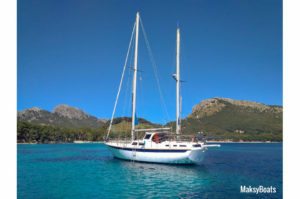 On board this excellent boat, with 3 cabins and 2 bathrooms, you will enjoy a unique experience, with multiple options of routes along the beautiful Bay of Pollença. There will be visits to beautiful coves, where you can swim and snorkel in crystal clear waters. Snacks and drinks, included in the price, will be the finishing touch for an unforgettable day. Fill out the booking request form with your data to get a customized quote. We will respond as soon as possible, thanks.